A Menger sponge can be constructed recursively as follows: Divide a given cube it into 27 smaller cubes. Then remove the six smaller cubes in the middle of each face and the smaller cube in the centre. This process is now repeated with each of the remaining 20 cubes. The illustration shows an approximation (three iterations) of a Menger sponge together with its reflection in two mirrors, spherical and a planar one. 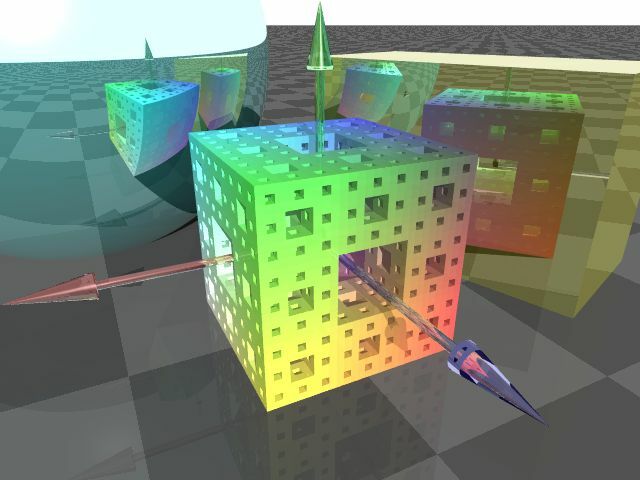 Created by Norbert Lange (2006) using POV-Ray - The Persistance of Vision Raytracer.